Here are our tips for choosing the perfect colors for your kitchen. Are you working on a kitchen remodel or just redecorating and wondering which color would look best? Have you redone your cabinets and want to re-paint your walls to harmonize with them? There are a few steps to consider the right color for your kitchen, and we will explore them today. It may sound silly but consider the mission of your kitchen. Are you a family who cooks a lot in their kitchen and it is a central hub in your home? Do you want your kitchen to match the rest of your home? 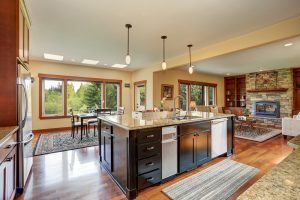 Is your kitchen more for show than use? Considering the function of your kitchen is an important step to determining the right color. To show heart in a vibrant, thriving and busy kitchen consider colors like yellows, oranges and other warm colors that are a little crisp in appearance. If your kitchen is more of a serene respite consider more muted colors like light blues, violets or greens. The kitchen’s mission can have an impact on the color you choose, but the color scheme of your kitchen can actually affect the mood in the rest of your home. Every time you walk into a room, color has the ability to impact how you feel. If your kitchen is a hubbub of energy choosing bright colors can give a boost in the mornings. If the kitchen is your space to decompress or do homework in the evenings, a tranquil color can be beneficial. Pay attention to how you feel looking at colors, this can have a deep affect on your home. A huge faux-pas of kitchen remodel is to paint the kitchen walls and the cabinets two opposing colors. Find colors that compliment each other and follow the same color pallet. For a light and bright kitchen consider an off white color or creme for your cabinet color. Make sure to take home color examples and hold them up in your kitchen to assess their compatibility. Columbia Paint Company would be happy to help you choose the perfect color to represent you in one of the most used rooms in your home, to help you pick the best window shades for your privacy and to offer you remodeling tips along the way. Schedule an appointment with Columbia Paint and see what we have to offer you in services. Schedule an appointment today by calling 443-319-4001 or visit us online. For other paint tips and update, follow us on Facebook, Twitter, Google+, LinkedIn, Houzz, YouTube and Pinterest!